Although mainly a hotel and motel city, Apartments & Villas in Rotorua are still quite plentiful. Relax in the privacy of a lakefront house, or city-side flat, and enjoy the flexibility that self-catering gives you. 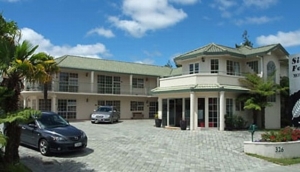 Rotorua Apartments & Villas tend to centre around the obvious visual benefits of Lake Rotorua. Many of the larger hotels will also have self-catering options, including apartments with kitchens. Booking a private apartment in a hotel, means you get the benefits of their facilities, too. The north end of Fenton Street, around Victoria Street, has lots of residential cottages and apartments for rent, in pretty, leafy roads. Tryon Street, in the south at Whakarewarewa, has some modern, compact apartments ideal for singles or couples who like to suit themselves. Pukakai Street, near the lake, is where you'll find the more high-end (and higher priced) executive apartments.